Set the oven to 350o F. Grease a pie dish. Rub the soft butter into the flour until it looks like crumbs. Or use the mixer on low for 3 mins, with a paddle. Add in the salt, honey, vanilla and milk. Mix by hand till a dough is formed. Knead for another minute. Or use the mixer on low for two minutes. Do not over knead, as this will make the crust rubbery. Roll out the crust, and place into the pie dish. Use a fork to dock it and bake empty in the oven for 8 minutes. In the meantime, place all the filling ingredients in the mixer to mix for 3 minutes.This can also be done by hand, but make sure everything is well mixed. When the crust has baked for 8 minutes, remove it from the oven, pour in the filling and bake for another 45 mins. 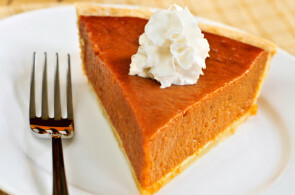 The pie is done when you insert a toothpick in the center of the pie and it comes out clean.